Strawberry pot was originally designed to grow multiple strawberry plants at any one time. Also, an ideal way to grow clean strawberries. It is basically an urn-shaped pot with an opening at the top with several small pockets along the sides. Although it is called so, the pot is not just for strawberries. It can be used for a variety of plants and perfect for growing a selection of herbs in a small area. It is a delight being able to cut off some fresh herbs for cooking just a few steps from the kitchen and all in one place, the strawberry pot. 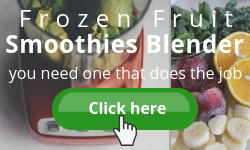 In this case, you may change its name to herbs pot! Ask yourself, what are your favourites? Are your favourites included here? Yes, no. 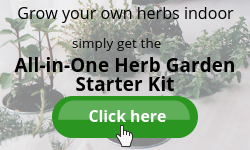 Click here to find out How to Grow Herbs All Year Round. 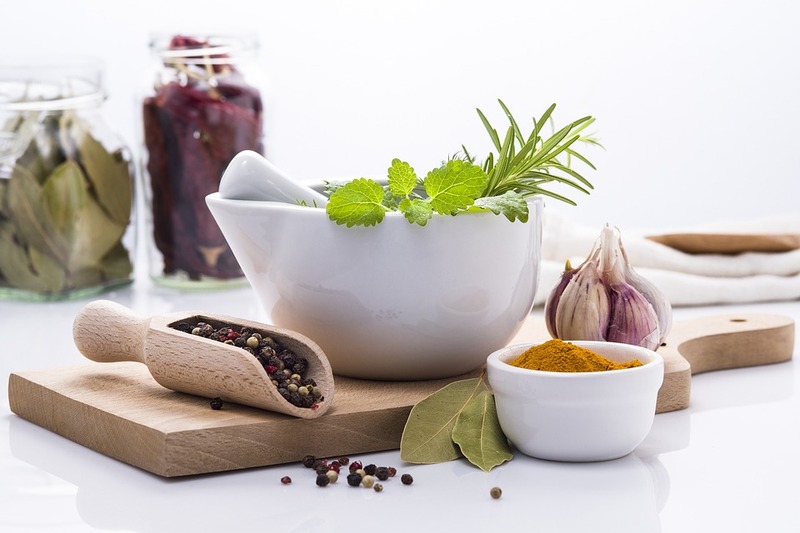 You will get to know which herbs can grow and thrive together. Also, step by step guides on how to propagate herbs from cuttings, transplant herb seedlings and grow herbs from seeds. At first thought, you will probably think of filling up the pot with potting soil and insert the plants into the pockets from the outside. I will not say this is incorrect but there is a better way to do it. It is easier to insert the plants from the inside out. Cover the drainage hole with a piece of stone or shard. This will prevent the potting soil from washing out the holes when you water. However, do not cover the hole completely. Doing so will clog the drainage holes causing the water to saturate the soil. This leads to root rot and dead plants. Fill the pot to the first level of the pockets with the sterile potting mix. It is a mistake to use garden soil to grow potted herbs. Garden soil is too heavy and will impede both drainage and aeration. Furthermore, the soil may contain insects, weed seed and disease organisms. Insert herb plant into the pocket from the inside out. Release the plant from its original pot and gently loosen the root ball. A well-grown herb plant tends to become root bound. You will need to open up the roots for aeration. Now, do you see why inserting the plant from inside out is easier than outside in? It will be difficult for you to insert the plant into the pocket from outside once the pot is filled with the soil. Imagine having to dig a space through the pocket, making way for the root ball. Isn’t it difficult to shove the root ball through the pocket from the outside? Or, what happens if the root ball is bigger than the pocket? You may break it loose to reduce the soil or cut off some roots. But, why the hassle? Furthermore, you may end up damaging the roots. Simply push the plant through the pocket from the inside, gently. It is alright to bend the herbs slightly. You won’t hurt them as they will continue to grow once settled nicely. After doing the same to the first level of the pockets, continue with the next step. Press down the soil and water with a gentle stream to settle the soil. Continue adding layers of potting soil until it reaches the top and inserts the herb plants as you go along. Remember to water them at each level. 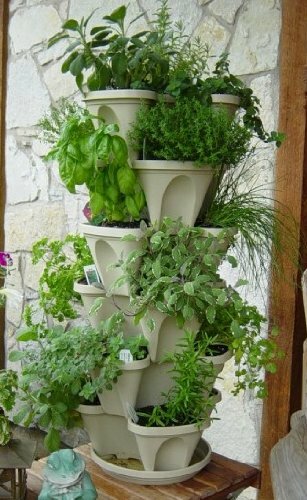 You will want to plant rosemary or basil at the very top. Rosemary can grow bushy while basil grows easily and upright. Since you will need to pinch the basil constantly to encourage leave to grow, it is easier for you to do so with the basil at the top. Lastly, water the top including the pockets thoroughly. After this first thorough watering, you will only need to water from the top. Depending on the climate, you may have to water it daily or as and when needed. Herbs do not like sitting in water. Therefore, it is best to water thoroughly than frequently. Allow the topsoil to dry out between watering. Finally, place the strawberry pot where it will receive 4-6 hours of sunlight daily. You may need to rotate the pot occasionally to ensure all the herb plants receive sun exposure. So, this is how you transplant your herbs into the strawberry pot. Do you think you will enjoy the process? If you love nature, I am sure you enjoy getting your hands ‘dirty’. Get your strawberry pot now! For those who like minimal work – forget about the digging, multiple layering and watering, there is an alternative. Before going into that, I would like to share with you some confusion of mine. Don’t worry, I am not going to confuse you too. Rather make things less complicated for you. Terracotta pots. Clay and ceramic pots. Of course, plastic pots. Let’s look into plastic and terracotta. "How about clay and ceramic?" you asked. Basically, terracotta, clay and ceramic are of the same source. Clay is a material. It is unfired. Ceramic is a product made out of clay. It is fired clay. Terracotta is a product of ceramic made from clay. It is red clay, fired or unfired. Do you see them as the same or different? Scientifically and technically, there are much more explanations than these to differentiate them. However, I dislike complicated matters and assume you too. Since all three are from the same source, let’s just say terracotta. Less complicated. Terracotta is a popular choice for the strawberry pot. It is porous, allowing the soil to breathe. Additionally, it absorbs heat pretty well which is good in early spring but can be too much in mid-summer. You will have to water frequently since it will dry out faster. You may even have to bring the pot into your house during winter as it may crack when exposed to fluctuating outdoor temperatures. Bear in mind that it can be heavy. Especially so, when it is filled with soil. Hence, you may need two people to lift it. Take care of your back! Plastic pot is a common choice for growing herbs. It is lighter and easier to move. However, it is not as durable because the colour may fade. Also, it tends to become brittle and chip when exposed to the elements for a long time. On the other hand, the plus point is that you need not water as frequently as the terracotta pot during the hot days as it can retain water much better. If you like terracotta and at the same time would love a light-weight pot, there are many plastic pots available which have realistic finishes that mimic terracotta. No matter what type of pots you choose to grow your herbs, be sure to fill it with the sterile potting mix, such as Foxfarm Organic Potting Soil to give your herb plants a strong start. Stackable Planter is a great alternative to the Strawberry Pot. This setup requires very little space while being decorative. The stackable design makes it easier to transplant your herbs, either nursery-bought seedlings or a well-grown herb plant. Simply stack the tiers once you have all the plants in the individual sections of each tier. You will like this – You can easily relocate this planter since it is detachable. No heavy lifting needed. Outside during the warmer months, inside during winter. Should you favour this Stackable Planter instead of the Strawberry Pot, you may want to look into these areas when choosing yours. The number of tiers. They come in 3 – 10 tiers. You can start with the minimum and add on later as you go along. It is important to know that although this planter can be heavy with soil and water, strong wind gusts can tip it over due to its height. Hence, you need to be careful where to place it and how many tiers to stack. Especially so with young kids around. The number of sections per tier. Usually, each tier has 3 to 4 sections. There is some larger stack that has 5 to 6 sections. More sections mean a larger stack and you may need a bigger space. Type of material. It should be BPA-free and made of food grade plastic. Self-Watering System. Not all stackable planters have a self-watering system. This is good to have but always be mindful to check the condition of the herbs. You may have to water the lower tiers yourself during hotter days. More so if you have a taller stack. As with the Strawberry Pot, remember to plant your rosemary or basil at the top tier. 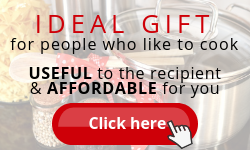 You may even consider growing lettuce or any salad leaves. Planting herbs in the strawberry pot or stackable planter is a brilliant way to grow herbs in small spaces. 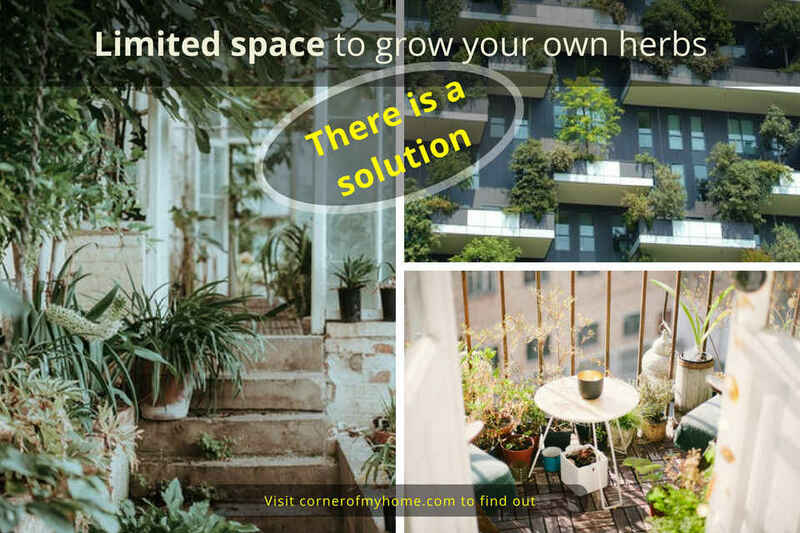 It is an ideal space-saving solution to grow an assortment of herbs. Visualize having different types of flavour in a small space. Does it entice you? Moreover, it beautifies your balcony or small yard and most importantly, you will be able to bring it inside during the winter months. Isn’t it wonderful? I am pretty sure your balcony will look more interesting. Do you see envious neighbours? If you have a problem of not getting enough sunlight indoor, consider getting a grow light. Click here to find the best grow lights for indoor plants – especially herbs. Now, the question is – What do you think of the Stackable Planter? Is it more convenient than the Strawberry Pot? Well, it all depends on your needs and the little space you have. If you intend to extend the number of herb plants, the stackable planter is a very good choice. But think of the possibility of it tipping over with a strong gust of wind. If you already have existing potteries at your yard or deck, you may want it to blend in. So, will it be the Strawberry Pot or the Stackable Planter for you? Let me know. 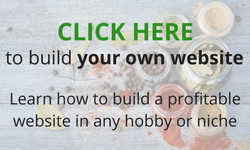 Are you growing your own herbs now? What containers are you using? Please share your thoughts or experiences you may have at the comments section below. It is time to showcase your love for herbs in this beautiful pot/planter. What a fantastic idea!!! We have small deck just outside our kitchen on the second floor. Right now our herbs are on the ground floor in a flower bed. The flowers tend to overpower the herbs…and it is a pain to walk downstairs to get herbs when you are cooking. Now with the strawberry pot, I can have all my herbs just steps away from the kitchen. Without having a bunch of smaller pots all over the place. We have a few herbs on pots on the deck. But we live at the coast and the winds would blow them off! I don’t think the wind could ever blow over this strawberry pot. Thanks again for the great idea!!!! You are most welcome. I am glad that this article has given you a pretty good solution. In your case, it is definitely yes to the strawberry pot rather than the stackable planter. 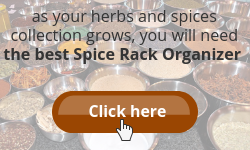 Isn’t it wonderful to have all your herbs neatly in one place? If you want to buy one anytime soon, you may use this link. That’s such a cool idea, Sharon. I’ve tried growing herbs in my garden but never had much luck with them. The plants that survive tend to get very leggy and don’t look very healthy. Insects and pests are probably to blame for a lot of that. I’ll give your strawberry pot idea a go, but grow the herbs indoors this time! There are several reasons why the herbs become leggy. It can be caused by insufficient sunlight as the plant grows rapidly in height searching for light. Inconsistent watering will also prevent the plant from growing strong stem. Thus, becomes leggy. Another possible reason is that the plants may be planted too close to each other. In this case, the plants grow taller to compete for light. Wish you all the BEST in growing your herbs indoors. Should you need any help, please feel free to contact me. You may want to read this, How to Grow Herbs Indoor Year Round. Thanks for sharing, Sharon. I know all about small spaces and I loved your suggestions. Love the strawberry pot though, so cute! Being able to see the versatility in ‘bringing Mother Nature’ on the inside of your home is just wonderful when you can use any of the pots you mentioned. And I loved the the comparison between plastic and terra cotta pots. Very thorough. Thanks, Sharon and keep doing a great job as you are currently doing. Thanks for the positive comments, Michelle. Also, for your continuous support. It means a lot to me. The strawberry pot is very cute indeed. To have one indoors will surely brighten up the surroundings. Not forgetting the variety of herbs you will be able to have in hand at any time. I have always had trouble growing herbs in my yard, I guess my family and I go away too much and neglect the poor little guys! This post on growing herbs in small spaces is great for we keep killing ours growing them in large spaces. If I were to grab some pots the same size as you suggest and put them inside, I would probably be able to look after them properly. 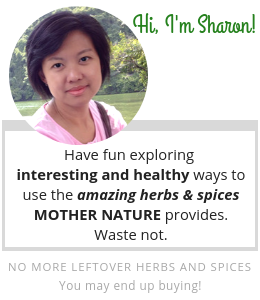 I will follow your steps to growing better herbs. I am glad this post gave you an idea how to keep your herbs “alive” indoors. Isn’t it great to have them so close to you? Freshly cut and immediately into the pot.